Hundreds of airports have bird problems and spend a great deal of money to protect aircraft from the hazards presented by them. Despite the various measures used to rid airports of the flying menaces, bird strikes near or at airports still occur – more than 5,000 every year. Usually aircraft sustain damage but manage to land safely. It is not uncommon for airlines to spend a million dollars repairing or replacing an engine that has ingested birds. Gander International Airport, not unlike most airports, has a means to take care of bird problems, and we seldom hear of bird strikes here. But Gander International Airport is known for other another kind of birds. When the government built the air terminal, it saw fit to enhance its interior with what has become the famous Birds of Welcome. 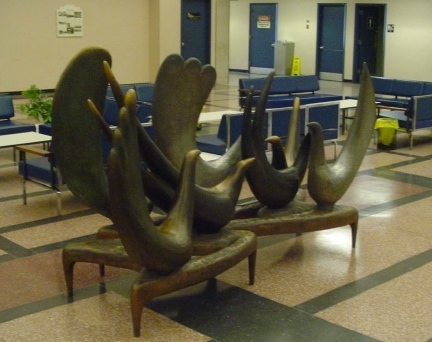 They were cast in bronze and aluminium by the sculptor, Art Price, and made especially for Gander International Airport. It is perhaps the most talked about a piece of work he has done. As people coming from Europe and the United States entered the International Lounge, they would gasp at the beauty of the seven birds that seem to twitter with excitement as the visitors step into the room. One person is quoted as saying, "They are so beautiful; it makes me know Canada is a beautiful country!" 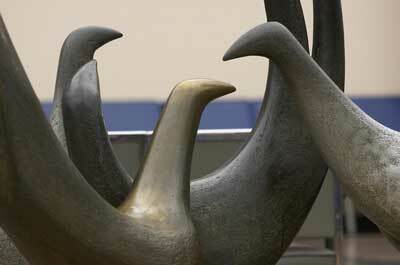 These welcoming birds are cast in rough-textured metal with polished highlights; two are of silvery gleaming silica aluminium; one is of golden-toned manganese bronze; the others are in statuary bronze. The birds seem so alive, alert and excited that one is sure the artist got joy out of creating them. 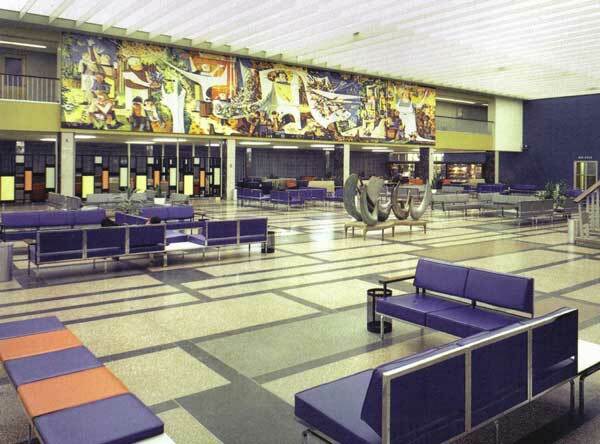 Of course, as anyone who has visited the International Lounge can attest, the large mural is a work of art – the like of which is rarely seen in other air terminals.